**Note: this post it limited in scope to the Single Sharepoint VM environment, anything more complicated is frankly beyond my feeble server administration skills. 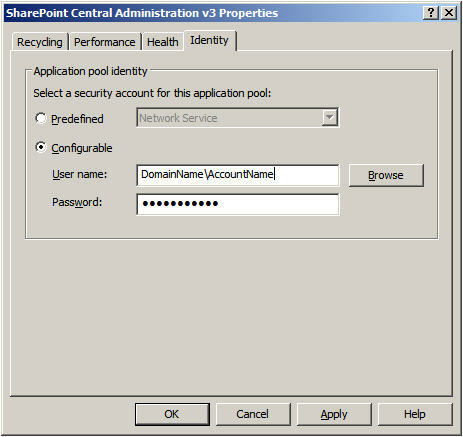 If you try to install AD and DNS onto a Sharepoint VM after having already installed Sharepoint you run into a range of problems. The first time I tried to fix the problem I fried my environment and had to revert to a snapshot. First, install AD and DNS as you normally would. Here’s a link to the guide I used. At this point if you try to hit your Central Administration site or any other Sharepoint site, you’ll get a Service Unavailable message on any page you hit. Aha! Adding a domain to the mix changes all the user accounts so that your old accounts need to be reconfigured. This is easily done by going into IIS Manager and updating the Identities of all of the app pools to reflect the new, domain enabled accounts. 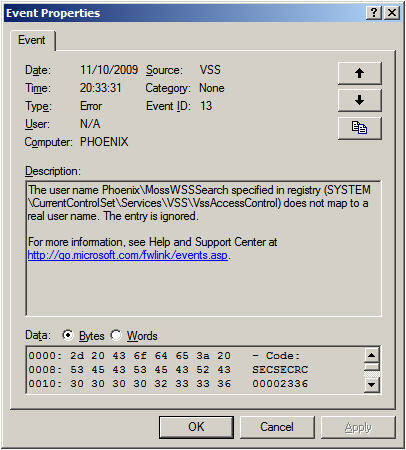 The current identity (domainName\MossServiceAcct) does not have write access to ‘c:\WINDOWS\Microsoft.NET\Framework\v2.0.50727\Temporary ASP.NET Files’. 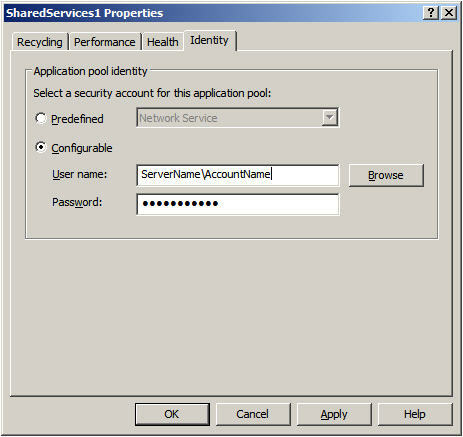 You can resolve this easily by navigating to that location and by granting write access to the folder in question (you will need to do this for each unique service account which hits the Temporary ASP.NET Files folder). Central Admin will loads, but hold on cowboy/girl, you won’t be able to get to any of the pages on the Operations or Application Management tabs. Following Joel’s tips I got 100% of the way, but the other page a good reference anyways. I found that there were so many passwords to re-enter that I missed a couple (specifically the stsadm -o editssp command) but got there in the end. Good luck, it’s a painful process, but a possible one. Just be careful and meticulous and you should be okay. 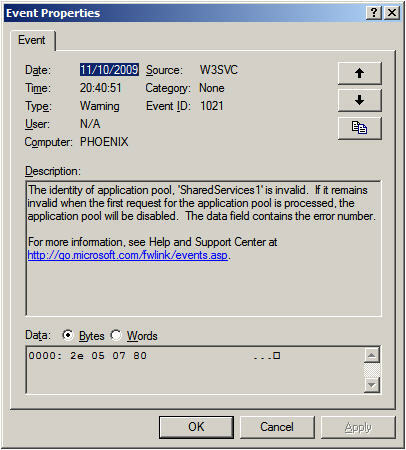 By admin on October 14, 2009 | Sharepoint | A comment? Have you ever had to re-attach a Sharepoint workflow after it has been removed? It is impossible via the browser (from what I can see) and via designer it is far from obvious how to accomplish this. What you need to do is open the workflow in Sharepoint Designer, click “Finish” and the workflow will re-attach itself. Not very obvious, but it works. Unfortunately there is no way to associate a workflow with another list unless you open the various workflow xml files change the list guids inside. By admin on October 11, 2009 | Uncategorized | A comment?